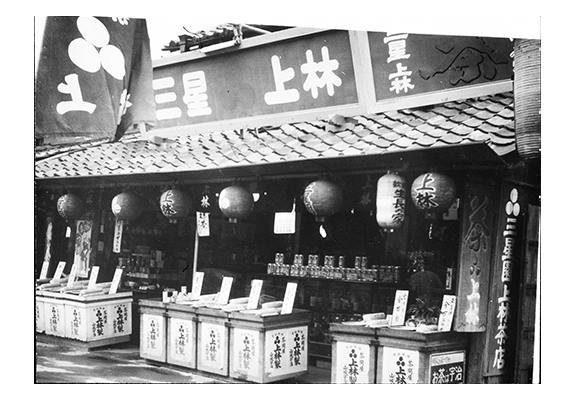 Mitsuboshien-Kanbayashisannyu-Honten is a long-established store first started in the Tensho Era. Along with the long history and tradition that it inherited, the store is known as the master of tea ceremony for the Shogunate. We do not aim to just sell genuine Uji Tea but also to impart the knowledge of taste and history of tea. We also provide tea-ceremony experience to customers. The family crest of the store is a registered trademark to symbolize “tea plantation” on the map. The data and references that are passed down generations are all kept in this library with the aim to preserve and to be useful in future research regarding the history and culture of Uji Tea. You can experience the making of powdered green tea (Matcha) here at the store. We provide detailed and simple instructions so that first-timers can too enjoy preparing tea on their own. We have been given the pleasure to teach many tourists and students, and we await your patron. Fee: 864 Yen/person (Japanese sweets are provided) if you make a reservation at least one day in advance. A Reservation on the same day as the Experience will be charged with 1080 Yen. Please contact us at TEL:(+81)0774-21-2636. 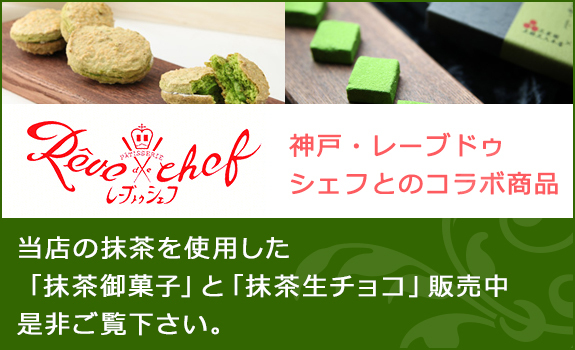 Whenever possible, we strongly recommend you to make reservations in advance, due the popularity of the Matcha experience. Enjoy and appreciate the taste of genuine Uji Tea at our Tea room! Menu ranges from green tea shaved ice to warm green tea set that varies throughout the year. In order to preserve the authenticity of the history and culture of the store, we do not put our tea on sale at any departmental store, supermarkets or creating a branch store. Do get some of our tea as souvenirs. Since Kyoto and Uji have not suffered from the earthquake, tsunami or radioactivity, our family is completely independent of radioactive contamination and everyday lives are going on normally as always. Transportation system including access to and from Kansai Airport and accommodation facilities in Kansai are functioning quite normally. Also the World Heritage Byodoin Temple and scenery around look as beautiful as ever. Our tea we sell in our shop just comes from tea fields from and around Uji in Kyoto. Delivered in vacuumed stored in an cold storage room in our own warehouse, just the required quantities of tea is processed by us and therefore we guarantee the products safety. Also the City of Kyoto confirmed on the 16th of May that there is no radioactive pollution in tea from Uji and Kyoto. Last but not least a big quantity of our tea was harvested before the Fukushima accident and so there is no radioactivity in this tea. In our shop, you have the chance to enjoy a tea experience including making your own Macha green tea powder and learn how to drink it correctly. Starting from small groups you can enjoy a simple experience of making the japanese tea ceremony. Just make an reservation by mail and enjoy a wonderful experience in Uji. Use the spoon (chashaku) and place a small amount of Macha (about 2 grams) into the bowl (chawan). Add about 60cc of hot water (not boiling). Use the bamboo wisk (chasen) to wisk the mixture to a uniform consistency. Use your wrist (not your elbow or arm) to make W-shaped whisking motions. Add 60cc of hot water (50°C ~ 60°C) into the tea cups. Insert the tea leaves into the tea pod (10 grams for 3 Person). Transfer the hot water (50°C ~ 60°C) in to the tea pod. Pour small amounts of tea into each cup. Continue pouring until you have poured every last drop from the teapot. Note: With the same amount of tea you will be abel to prepare about 4 servings of tea, just add hot water. We recommend you to increase the water temperature by about 5°C for additional servings. Gyokuro is been grown under the shade rather than the full sun. Insert the tea leaves into the tea pod (8 ~ 10 grams for 3 Person). Add 180cc of hot water (80°C ~ 90°C) into the tea pod. Pour small amounts of tea into each cup. Continue pouring until you have poured every last drop from the teapot. Note: With the same amount of tea you can prepare about 4 servings of tea, just add hot water. We recommend you to increase the water temperature by about 5°C for additional servings. Sencha in Japan is drunk hot in the cooler months and usually chilled in the summer months. Add 200 - 300cc of hot water (~ 90°C) into the tea pod and wait 30 seconds. Chilled Sencha: For the first preparation you have to wait about 3 minutes. Every additional serving can be prepared immediately without long waiting time. Copyright (c) 2015 - 2019 有限会社 三星園上林三入本店 All Rights Reserved.